I was out walking about three hours before my New Orleans running buddies reported for the Rex Run – beautiful woods in the dark with the snow making things visible. Sounded like a couple of tons of geese on the Mill Gut, squawking in the night. Snow falling in various quantities, from fitful flakes to great wet clusters; when I turned into the wind my glasses completely clogged up. Thinking of the gang having King Cake and champagne, then the parades. A quick weather check from here suggests that it would be a great day for a record attempt at the Rex Run given the chilly temps (at 34 degrees only four degrees above the Bristol temperature) – hope it warms up enough later. 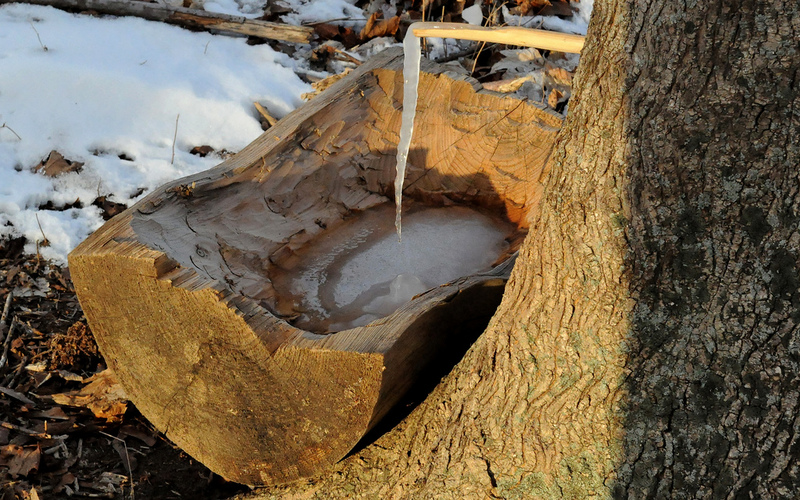 They tapped the trees at Coggeshall Farm about 10 days later this year than last year, but the sap froze overnight. The farm is doing its annual sugaring demonstration. Picture was taken on Valentine’s Day.